Solar off-grid systems are a big part of our business. We design systems to meet customer needs, wants and budget with varying degrees of automation. A solar electricity system lifespan can be over 25 years, so imagine how much it could reduce your household running costs over this time. An off-grid system provides an opportunity for independence from power companies, allowing you the freedom to create and store your own energy. An off-grid solar Photovoltaic panel system uses batteries to store the electricity, which is generated from the sun. During sunshine hours the photovoltaic panels harness the UV light rays from the sun to produce Direct Current (DC) electricity. The DC electricity is routed through wiring to a solar controller, which controls the charging of deep cycle batteries. The DC power travels from the batteries to the inverter which changes the DC battery electricity to usable AC household electricity, to supply all your household energy needs. 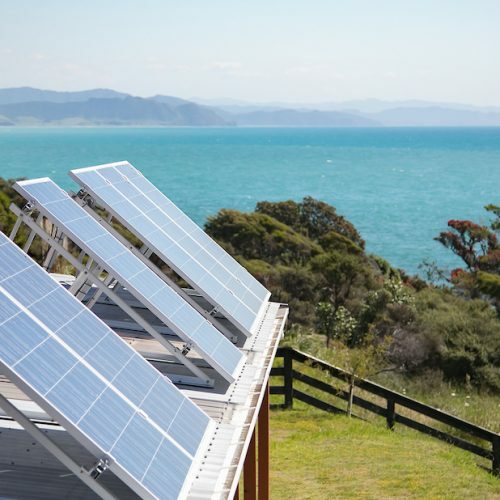 Solar Options uses solar controllers to monitor the battery bank and regulate the energy charge to ensure maximum charging capacity without damaging the battery bank. The solar controller helps to prolong the life of the batteries. A Grade modules – 25 year warranty.